The FIRST title ever mass-produced on LD! Multiple packaging over the years, from a box to a sleeve... same disc content. 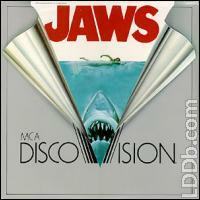 For extended details on the MCA DiscoVision versions of JAWS, please visit the BLAM Entertainment Web Site. © 2002-2019 / Contact: Time elapsed: 0.128 sec.